Today (March 2, 2019), we’re celebrating Dr. Seuss’ birthday by posting this inspiring excerpt from The Lorax. Globally, around 50 billion land animals and up to 2 trillion sea animals are killed every year for food no human biologically needs, while (at the same time) our planet is facing existential threats from climate change, species extinctions, habitat loss, and other converging environmental crises (incidentally driven in large part by our mass consumption of animal foods). Indeed, “nothing is going to get better” unless each of us cares enough to takes responsibility in our personal lives. In addition to the moral imperative to not harm other animals when we don’t have to, a mass global shift away from animal foods is urgently needed if we are to have any hope of surviving the ecological challenges currently before us. Going vegan is not all that we need to do, but it is one of the actions that is urgently needed. 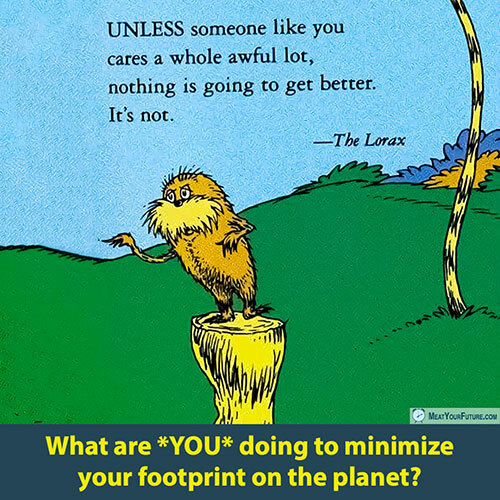 So, what are YOU doing do minimize your footprint on this one and only planet we call home?